The Highland breed is by far one of the most distinctive cattle breeds in the world with their majestic sweeping horns and long, thick hair coat. The Highland breed has remained unaltered throughout the centuries. Known in Scotland for their tremendous resilience and great maternal instincts, the Highland is well known for thriving in harsh climates with poor foliage. Highlands are one of the oldest registered breeds of cattle, with the first herd book established in 1884. Around that time, American cattlemen from the western United States recognized the natural qualities of the Highland cattle and imported them to improve the bloodlines of the commercial beef herds. Highlands come in a variety of colors: red, yellow, dun, brindle, black, silver and white. The Highland is a disease resistant breed. The long lashes and forelocks shield their eyes from insects making pink-eye and cancer uncommon. Due to genetic advantages, the Highlands are less affected by other bovine diseases. Docile and even tempered, Highlands are a desirable breed for hobbyists and commercial cattlemen alike. Superior in intellect, the Highland is very trainable on a halter. Highlands are very efficient grazers, which means that they are able to gain on pastures that other cattle may not do as well on. Known for their browsing abilities, these cattle are sought after as economical means of clearing overgrown pastures and wooded areas. Having the ability to browse with great efficiency makes the Highland the ideal animal for true grass fed programs. The many positive attributes of a Highland cow make her desirable to breeders across the world. Lower birthing weights, excellent maternal instincts with on board defense make her the ideal efficient cow. 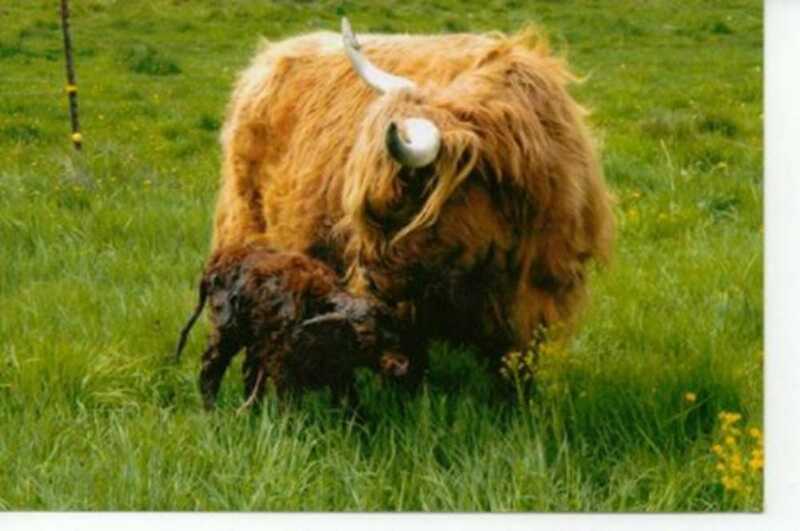 The Highland calves are vigorous at birth and almost never require assistance. Highland bulls contribute to the breed with their high fertility and gentle demeanor. Bulls can weigh in excess of 1,800 pounds. Excellent legs and large hooves make them sound, capable breeders for many years. The Highland beef carcass is a lean, well-marbled beef that is known for its succulent flavor and tenderness. Highland beef has lower levels of fat and cholesterol and a higher protein and iron content than other breeds. The leanness is attributed to the heavy hair coat, thus layers of unwanted fat are not needed on a Highland animal. High carcass yields are prevalent with the Highland breed. Cross-breeding adds the genetic hardiness of the Highland and hybrid-vigor to a typical beef calf that provides the ability to produce economically raised high quality beef carcasses.